Michael J. Clark of Montana Trails Trophy Outfitters will show you an enjoyable hunting trip that you will never forget! With a hearty smile and a firm handshake, Michael J. Clark, owner of Montana Trails Trophy Outfitters welcomes you to the rugged mountains, rolling foothills and vast prairies of the Big Sky Country of Montana. Michael is a Native Montanan of 52 years and has been called Michael J. "Mule Deer" Dundee by his clients. You will be outfitted and guided by a 4th generation God-fearing Montanan with 35 years of hunting experience, who will show you over 135,000 acres of country that's serene, beautiful and exhilarating. You will see antelope on the prairies, mule deer in the breaks, whitetail in the river bottoms, and elk in the foothills of the mountains. So be sure to bring your rifle, shotgun and camera! There are also some wonderful bird hunting opportunties in Montana with Hungarian partridge in Region 5 and Sharptail grouse most prevelant in Region 7. Sage Grouse (Prairie chickens), Sharptail grouse and Hungarian partridge all abound here and are hunted if you desire. 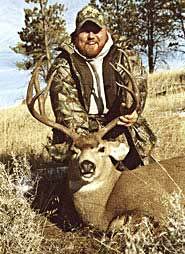 Let Michael J. Clark of Montana Trails Trophy Outfitters be your guide and outfitter and he will show you an enjoyable hunting trip that you will never forget! Application deadlines for deer and elk are typically held in March while antelope is usually sometime in June. For more information on available dates and price quotes go to the Montana Trails Trophy Outfitters web site below. To book a hunt now call: 406-686-4761 or E mail.